you’ll see; this time it’ll be different. Joan Miro, Pierre A Feu, original colour lithographs, double page, 38 x 56 cm, double-sided. DLM no. 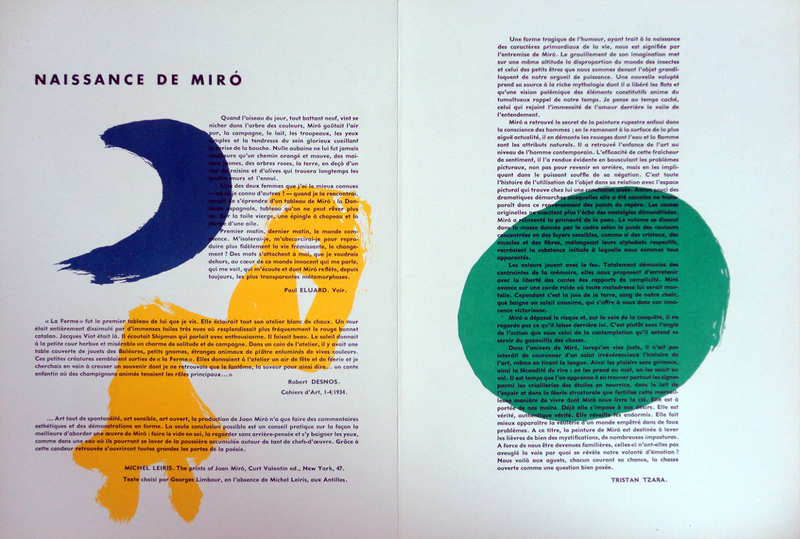 14-15 published in 1948 on the occasion of the artist’s first exhibition at the Galerie Maeght in Paris; contains 8 pages (including cover) with original colour lithographs printed on top of texts by Tristan Tzara, Jean Cassou, Raymond Queneau, Paul Eluard, Ernest Hemingway, Christian Zervos, Robert Desnos, Georges Hugnet René Gaffé. 500€, unframed, VAT excl., packaging and transport not incl.